BEIJING: Amid the long-simmering territorial row between China and Japan, Chinese military has asserted that its submarines are free to navigate international waters. Chinese submarines are free to navigate international waters, including the Northwest Pacific, which is also visited by other nations’ maritime forces, spokesman for China’s Ministry of National Defence, Geng Yansheng, said yesterday. Geng also criticised the so-called “China Military Threat”, as described by some Japanese media, as an act of “intentionally creating tension with an ulterior political motive,” state-runXinhua news agency reported today. “Such act is irresponsible and not conducive to peace and stability in the region,” he said. Geng made the remarks in response to a question regarding some Japanese media outlets’ recent, frequent reporting on the voyages of China’s Yuan-type submarines in Japan’s contiguous zones. Japan’s coastguard recently said that the Chinese maritime surveillance vessels were spotted inside the 12-nautical-mile zone off the Senkaku islands, which China calls the Diaoyus, in the East China Sea. The move marked the latest in the decades long standoff between Beijing and Tokyo as they jostle over ownership of the resource-rich islands. Last September, Japan nationalised three islands in the chain, angering China. This entry was posted in The world's submarines and tagged China, Japan, Submarine on June 1, 2013 by jasonlockley. Prime Minister Shinzo Abe has once again issued a warning against any intrusion into Japan’s territorial waters, this time referring to foreign submarines that will attempt to pass through underwater. This is in response to the Defense Ministry’s report that a foreign submarine was spotted just outside the contiguous zone, south of Kumejima Island in Okinawa Prefecture on Tuesday. The contiguous zone is a 12 nautical mile strip outside territorial waters so the submarine still did not violate any international laws. Rules state that vessels can pass freely through the waters given that their intentions are peaceful. Submarines are required to surface and display their national flags if they are already navigating in territorial waters. There is still no indication from what country the spotted vessel was but Ministry officials have said that they probably belong to the Chinese Navy. Abe told the parliament that submarines entering territorial waters is a “serious issue” and would require maritime security action. This indicates that the Ministry could direct Japan’s Self Defense Forces to move if there would be any confirmed intrusion. This incident, while not violating any laws, is too close to reports of three Chinese government ships that were near the disputed Senkaku/Diaoyu islands last Monday. The Japanese Coast Guard says that this is the 43rd incident of Chinese ships entering Japanese waters since September 2012. While observers do not believe that China would mount any actual attack or military move on the waters, it is just further proof of them boasting their naval and military capabilities. They have been criticized for showing off an aggressive stance against countries that have a territorial dispute with them, particularly Vietnam, the Philippines and Japan. A foreign submarine was detected in a contiguous zone just outside Japanese territorial waters south of Kumejima Island in Okinawa Prefecture, Japan’s Defense Ministry revealed on Tuesday. Ministry officials did not elaborate on the submarine vessel’s country of origin, but a government source revealed that the sub likely belonged to the Chinese Navy. “I was prepared to order ‘maritime security operations’ immediately upon getting approval from the Prime Minister (Shinzo Abe), if the submarine entered Japan’s territorial waters,” Defense Minister Itsunori Onodera told reporters on May 13. Under the current Self-Defense Forces Law, Onodera has the authority to order Japan’s Self-Defense Forces (SDF) units to conduct whatever was necessary to protect Japanese lives and property at risk, and to maintain the nation’s security at sea. These circumstances, often termed as “maritime security operations,” allow the SDF to use weapons in lawful self-defense and emergency evacuation of citizens. The last time such an order was made was in November 2004, when a Chinese submarine entered Japan’s territorial waters – the area around the Sakishima island chain in Okinawa Prefecture. The latest case did not involve any incursion into Japanese territorial waters, but Onodera is believed to have mentioned such information as a stern warning to any country that may have been involved. It is known that international law does not prohibit submarines from entering contiguous zones such as in this incident. It is a calculated tact by Japan’s Defense Ministry to make the latest incident public because of the fact that the passage through the contiguous zone was over a prolonged period of time, which made it very unusual. Tense maritime situations have been par for the course with China and Japan as the territorial dispute over the Senkaku/Diaoyu island chain continues to drag on. On Monday, three Chinese maritime surface ships broke the 12-nautical-mile rule and approached one of the islands, which according to the Japanese Coast Guard was the 43rd incident where Chinese ships in the area entered Japanese territorial waters since September 2012. This incident, including the submarine issue, is causing further tension in an already escalating situation. This entry was posted in The world's submarines and tagged China, Contiguous zone, Japan, Shinzo Abe, Submarine on May 15, 2013 by jasonlockley. Australian authorities investigate after divers damage the hull of a wartime mini submarine in the waters off Sydney. Vandals have damaged the wreckage of a Japanese mini submarine that attacked Sydney Harbour during World War Two, stealing parts and protected relics. The crews from two of the three vessels involved in the assault scuttled their boats and committed suicide, but the fate of the third was unknown until 2006 when scuba divers discovered it off Sydney’s northern beaches. Authorities put an exclusion zone around the vessel, which is believed to contain the remains of the two crew members and personal items such as samurai swords and good luck charms. It is supposedly monitored by long-range cameras. But divers entered the site, damaged the hull of the midget submarine and stole relics, Australia’s Environment Department said in an appeal for information, without specifying what had been taken. “The resulting damage includes the breaking off and removal of two of three visible propeller blades … of the submarine, causing permanent damage to a significant piece of Australia’s WWII heritage,” the department said. The damage was discovered during an archaeological inspection. Anyone found guilty of damaging or disturbing a protected wreck faces up to five years in jail. The site is also protected under New South Wales heritage laws, with a breach incurring a fine of up to AU$1.1m (£763,000). The lethal assault in 1942 came after a Japanese reconnaissance flight reported Allied warships anchored in Sydney Harbour. The commanding officer of a flotilla of five large Japanese submarines cruising off the city decided to attack with three mini submarines, each carrying a two-man crew. They avoided the partially constructed Sydney Harbour anti-submarine boom net and attempted to sink the warships but were detected and attacked. One submarine attempted to torpedo the heavy cruiser USS Chicago, but instead sank the converted Australian ferry HMAS Kuttabul, killing 21 sailors. This entry was posted in The world's submarines, Video Clip and tagged Australia, HMAS Kuttabul, Japan, Mini submarine, Sydney, USS Chicago, WW2 on March 15, 2013 by jasonlockley. Click on picture to hear the radio broadcast interview. The Australian Navy says it hopes to secure a deal that would allow it to rebuild its troubled Collins-class fleet with Japanese submarine technology. The deal could postpone the spending of an estimated $40 billion to build 12 new submarines proposed by the Australian Government. Australia’s Future Submarine project was discussed during the Australia-Japan Conference in Tokyo this month. DUPONT: Well it’s not a question of whether Australia wants it, Australia is looking to replace an existing fleet of Collins-class submarines and Japan is one of the options. And it could be an off-the-shelf Japanese design which is a Soryu class submarine, this is an advanced conventional submarine which the Japanese have only actually added to their fleet in the last three or four years, or it could be just some components of the system the Japanese use which might be compatible with our own requirements. So there are two options there and the Japanese Soryu class submarine of course would be considered along with other potential candidates, such as a German submarine which is comparable with lesser range, or in building the Collins-class follow-on submarines within Australia indigenously. So they’re the kind of options on the table for the government. MCCARTHY: So the deal is far from done although it does have some high profile advocates in Tokyo. How likely do you think that it will go ahead? DUPONT: Look I’d have to say at the moment it’s probably no better than a one in three chance of going ahead for two reasons; one is because it’s not clear yet what kind of submarine Australia’s going to end up with, and I suspect that will be dependent on the next government, which is as you are well aware there’s an election in six months. The other problem with the Japanese option is the constraints on the export of defence technology by the Japanese government. So this has prevented them from exporting submarines in the past and essentially all defence related technology they produce. However these constraints are actually being loosened and it appears the door is now open for potential cooperation with Australia on a range of defence technologies, including the submarine. But at the moment it’s still a little unclear as to where this is going to take us. MCCARTHY: And assuming Japan does ease this ban that it’s had on defence technology, what’s in it for them? DUPONT: Well there’s a lot in it for Japan. First of all they need to be world’s best practice in their defence sector too, and they can’t do it just confining themselves to their own capabilities, so cooperation with other partners with leading edge defence technologies is essential for the development for Japan’s own defence industry. Second, this has become much more important for Japan now as geo-political tensions are ratcheting up in north-east Asia, and particularly with China. So the Japanese are very concerned now about making sure that they can have the best technology possible for the development of their own defence force. So that means that they’re going to have to cooperate with friends and allies. Now previously Japan has had a pretty close relationship with the United States and has been able to export some of its own technology to the United States and receive some in return. But I think Japan is looking for other partners that it can do with and this is where Australia comes into the picture, because we are a leading edge country in many of these sectors as well, and there would be some benefits for Japan in building cooperation with Australia through the defence sector. MCCARTHY: So it’s fair to say then that Japan sees strategic value in this kind of relationship with Australia, rather than it simply Australia being the only country lining up and asking to buy these subs? DUPONT: Absolutely, you have to see it in the context of a broader more ambitious relationship between Japan and Australia which transcends the old trade relationship. MCCARTHY: And if Japan’s motive here is about building strategic alliances to try and counter the growing might of China, what’s that going to mean for Australia’s relationship with China, how will they view these closer military ties between Canberra and Tokyo? DUPONT: Yes well look there are some obvious sensitivities around all this, so even if it was technically feasible and politically feasible for Australia and Japan to do this in terms of their own domestic audiences, obviously both countries have to give consideration to the likely regional response, particularly that of China. But not only China, because other countries too might be a bit nervous about the implications. So I think all of this is doable and manageable, but there would have to be a considered political strategy, a narrative around this which would basically reduce and lessen any potential tensions with other countries, especially China. This entry was posted in The world's submarines and tagged Australia, Collins Class, Japan, Radio Clip on March 12, 2013 by jasonlockley. Chinese People’s Liberation Army–Navy (PLA-N) ships earlier this week dropped a number of mysterious buoys around a group of islands in the East China Sea, and although Beijing says they are to monitor ocean conditions, suspicions abound. The islands are the disputed string called Senkaku by Japan and Diaoyu by China and have for many years been the centre of an increasingly nationalistic tussle between the two powers. Multiple military planes and ships belligerently traverse the area, inflaming tensions, but submarines have mainly been overlooked. The buoys may really be for a scientific experiment, as Chinese foreign ministry officials claim, but it is more likely they are part of an expanding system of submarine detectors or sonobuoys China is using to monitor Japanese submarines. Some were dropped just 300m from Japanese-controlled waters. While surface tension and conflicts are featured in the news media, beneath the waves submarines are almost forgotten. 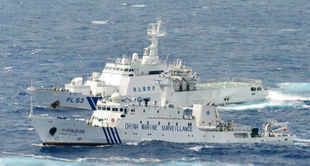 Submarine detection is difficult in the noisy and shallow waters typical of the South China Sea and the East China Sea. Acoustic energy from passive and active sonar technology is more likely to reflect off the seabed than in deeper waters, such as in the Philippine Sea. Both countries have a number of different classes of submarines but the Chinese diesel-electric vessels are noisier than Japan’s more advanced similarly powered craft. But the PLA-N’s newest Jin-class nuclear-powered ballistic missile submarines (SSBNs) are a mighty addition to Chinese undersea capabilities. While only two are assumed to be operational, and China is struggling with nuclear power at sea, they add serious firepower to its fleet. And they may soon be equipped with JL-2 nuclear-tipped ballistic missiles, which, according to initial estimates, can reach the United States, meaning America’s nuclear deterrence strategy would be undermined. A submarine’s stealth makes it ideally suited for operating in restricted or sensitive waters, making them ideal for the tense waters around the Senkaku/ Diaoyu islands. The reason for such tension becomes very clear on a map. Geographically, they occupy an extremely strategic position for both Japan and China. They are a gateway for China into the greater Western Pacific. Controlling them would effectively allow the PLA-N to break out of the claustrophobic South China Sea, a result they desperately desire. Likewise, keeping them in Tokyo’s hands would help Japan pen China into their territorial waters and put a temporary lid on Beijing’s expansionist dreams. China’s development of a world-class submarine fleet is in its infancy, but even now Beijing can quietly project power a significant distance from its shores. This is why the outcome of the Senkaku/Diaoyu islands dispute is so important for both nations. Controlling them would give Chinese submarines unfettered access to the Western Pacific and increase Beijing’s strategic options in the Eastern Pacific. It would also open up the rest of the Pacific for exploration by its submarines, possibly sailing with nuclear-tipped ballistic missiles. Only the US and Russia possess similar capabilities. Adding a third nation to the list will radically alter the strategic nuclear leverage America has enjoyed in the Pacific since the end of the Cold War. Ultimately, Tokyo will not end its submarine patrols around the disputed islands, despite the Chinese sonobuoy drop. 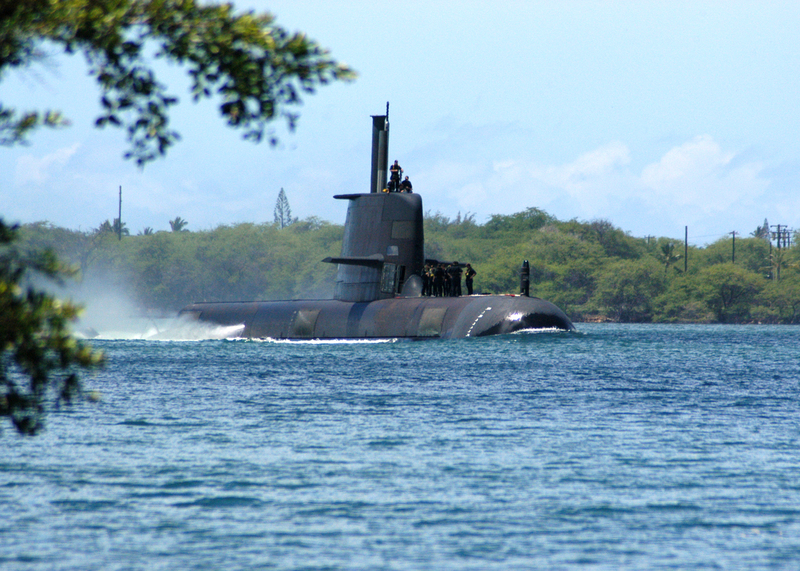 Submarines are an integral part of the monitoring of major sea routes to Japan. With heightened military movements in the region the chance of an accident increases. And with so much firepower in close proximity should the US become involved – along with widespread and popular nationalism in both Japan and China – the need to tread carefully to avoid escalating hostilities is paramount. This entry was posted in The world's submarines and tagged China, Diaoyu, Japan, PLA-N, Senkaku, Sonar buoys on March 9, 2013 by jasonlockley.